With LadderWORK you haven't to know nothing about assembler, interrupts or hardware architectures. All you have to do is think your project as a electrical scheme where you have to disposition switches, relays and lamps. Switches means inputs, lamps means outputs and relays gives the way to create states and elementary memory cells. Many problems related to control automation can be resolved in few minutes using LadderWORK.Put a PLC into your microcontroller! With LadderWORK you can transfrom a microcontroller in a PLC . Microcontroller support is activated simply selecting your MPU model during project setup. For example if i select the 8051 MPU the system put to disposition all the 8051 chip I/O resources. So when i configure my input or output devices i directly see the resource named P.0 .. P.7 which means that the system will drive the relative hardware pin. 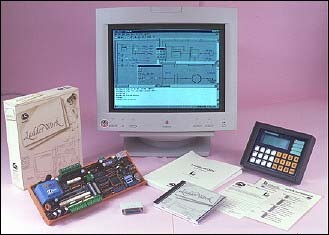 Full 8051 ADVANCED version includes USER FUNCTIONS so if you need a particular device you can write your assembly routine for your needing. The picture below, represents the apperance of the program LadderWORK on your computer. 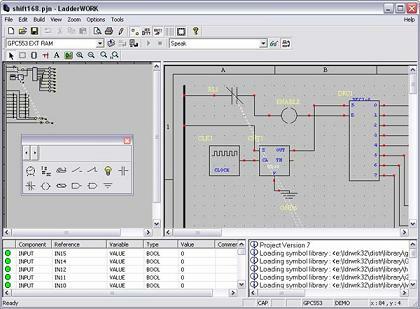 LadderWORK has an integrated environment feature, allowing you to draw schematics, compile programs and upload code to PLC always working on the same window. The integrated environments are composed by several parts described below. Watching and probing capability: The variables related to the objects placed in the schematic could be watched. During PLC running a watch window will show real-time, the value of this variables. Also, the nodes in the schematic could be probed. Placing the probe component in a particular node will show the value of the node during running. Note that these feature will require a dedicated serial port. HMI & MMI: LadderWORK integrates the possibility to create HMI (Human-Machine-Interface) or MMI (Man-Machine-Interface) directly with the using of dedicated components like DISPLAY and FIELD. The HMI kernel allow you to drive up to four distinct character-based operator panel. 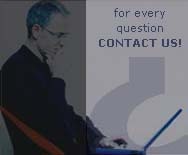 IEC 1131-3 Compliant function blocks : Our goal is to meet the IEC / CEI 1131-3 standard. A lot of new standard-compliant function blocks will be ready in the next issues of the software. Download a functional demo of LadderWORK now! tchlw008.pdf Making a LED connected to a 8051 port BLINK! This is your very first project with LadderWORK! What you need to try this project is just a 8051 chip and a LED connected to a port pin. A REAL COMPLETE TUTORIAL to run your first LadderWORK project.